How often do you feel intrigued, inspired and joyous after a conversation with a person you don’t know at all? I don’t know about you but it certainly is ‘rarest of rare’ occurrence for me. This is what I experienced while speaking to Hema Kannan, the person behind The Lotus Shakti. 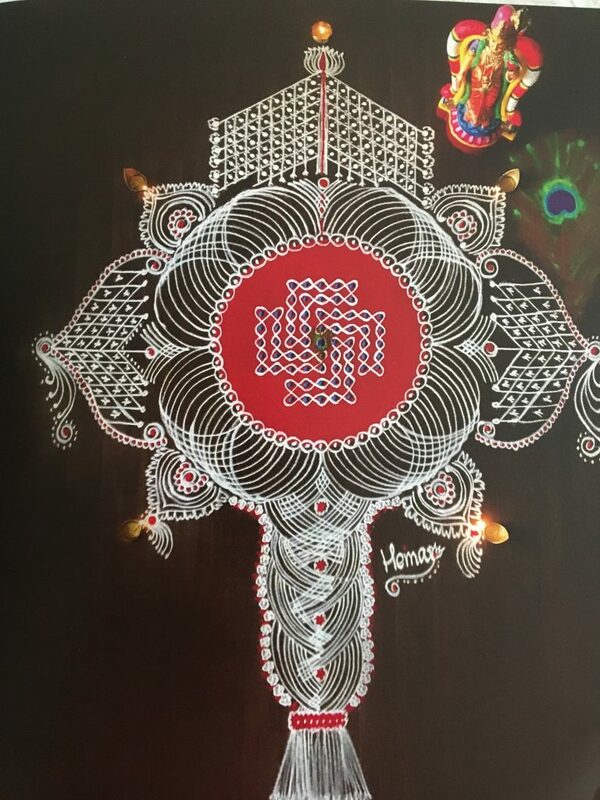 Hema has inspired many like me through her divine Kolams. 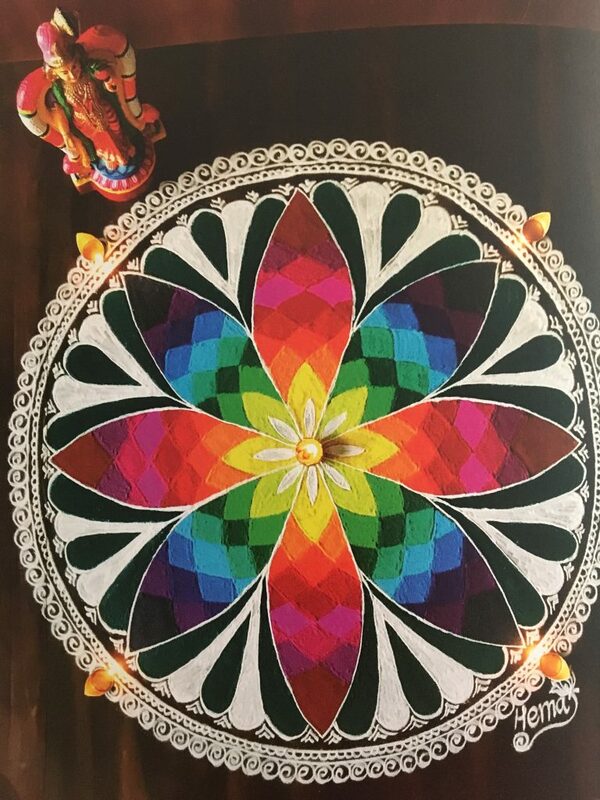 Her recently published coffee table book, titled Aatmashakti is an incredible journey to self discovery and spiritual strength through her awe-inspiring ‘Kolams’. ‘Kolams’ are free hand line drawings, drawn by using rice flour or chalk powder, predominant in the southern states of India. It also holds many other names such as Rangoli, Aipan, Aripan, Hase and maybe more. We had written about the Himachal art of Aipan not so long ago. Discovering the Kolams with Hema and what they mean to her was a beautiful experience and it’s truly a pleasure to share it with you all. 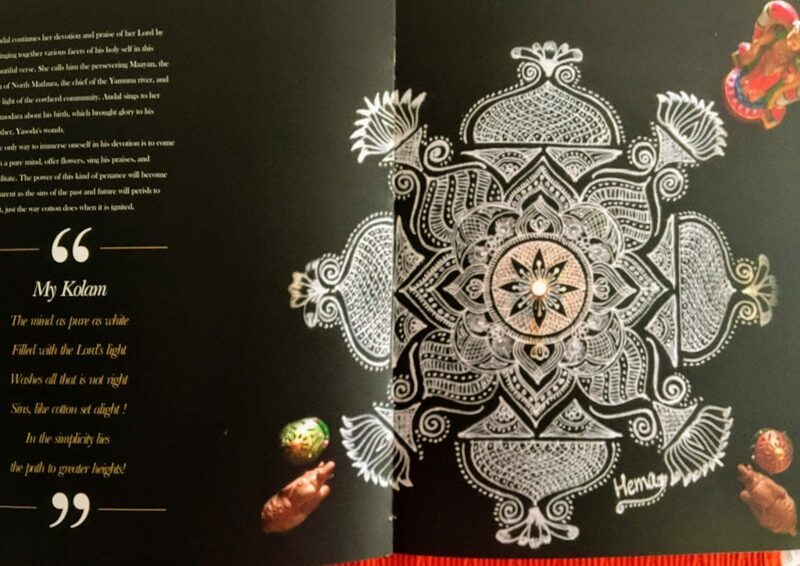 Hema re-started her journey with ‘Kolams’ four years ago as a way of expressing her thoughts, with the dance of her fingers using simply just rice powder. Encouraged by the appreciation from friends and family, and huge popular demand, she decided to give a shot to teaching the art of ‘Kolams’. In addition to teaching, her own spiritual journey was shaping up, with the guidance of her ‘guru’, Rangam Aunty. 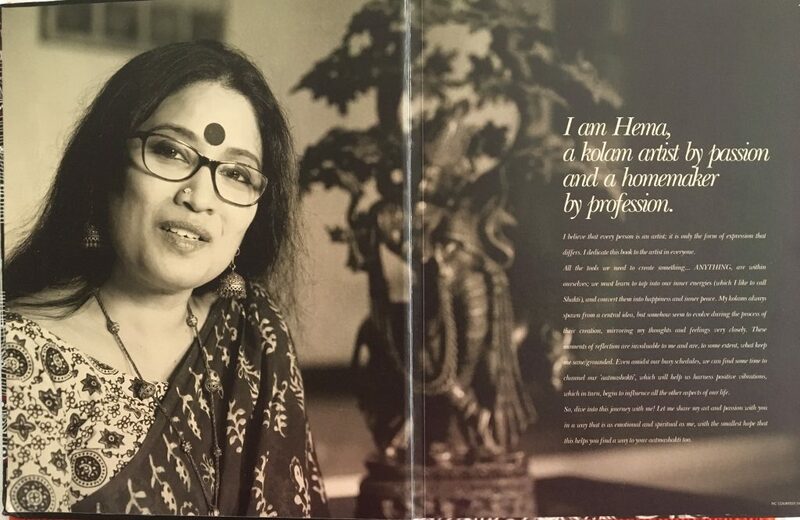 Hema’s inspiration since very early days and as well as on re-starting her journey with ‘Kolams’ four years back, has been her ‘Amma’ (mother). While keenly observing her mother, then as a teen, she took over the ‘Kolam-making’ responsibility from her completely. However, there was a break when she moved to Mumbai after getting married. 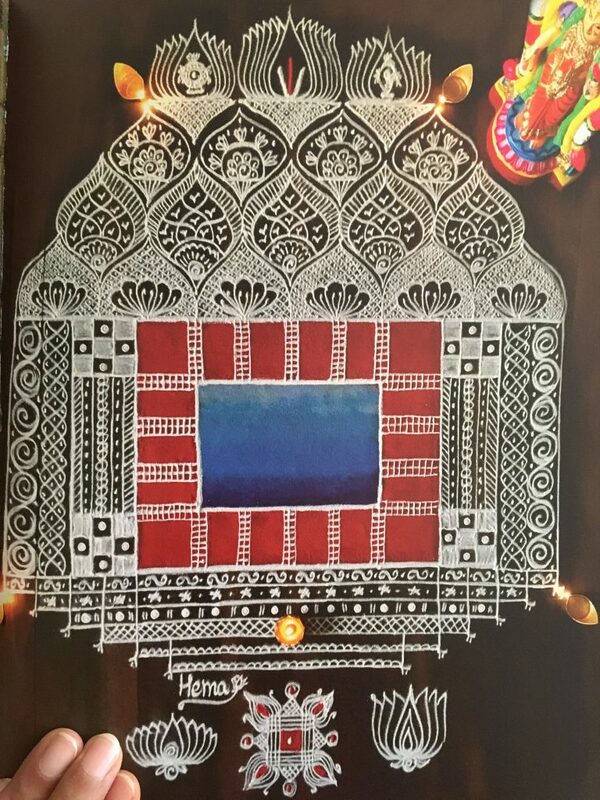 It was just about four years back, when Hema noticed that in the month of ‘Margazhyi’ (16th December – 14th January), her mother planned the ‘Kolam’ for the next day, the night before. The following morning she played the sacred verses and made ‘Kolams’ throughout this auspicious month. 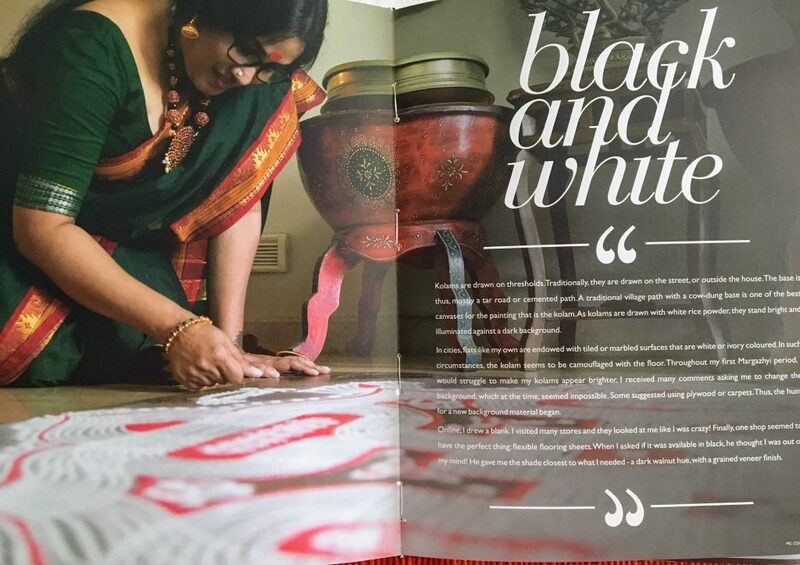 Totally inspired, Hema decided to go back to making ‘Kolams’, for a period of six continuous days in 2014. Then going forward, she committed to making them every single day, thus continuing her mother’s tradition. The book came to me with a lovely personal note from Hema, exuding a feeling of love and positivity, just as she had intended. She self-published and self-distributes the coffee table book, and that gives her a sense of fulfilment. 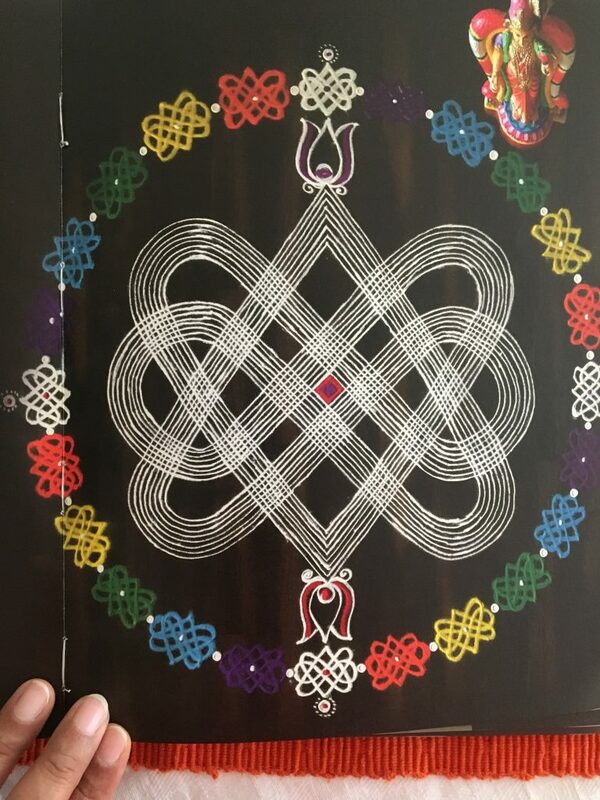 In addition to the rich visuals and breathtaking ‘Kolams’, there are verses from the Thiruppavai (the Thiruppavai is a collection of thirty stanzas aka paasurams) written in Tamil by Andal, in praise of the Lord Perumal, (Vishnu)) for each of the thirty days of ‘Margazhyi’. 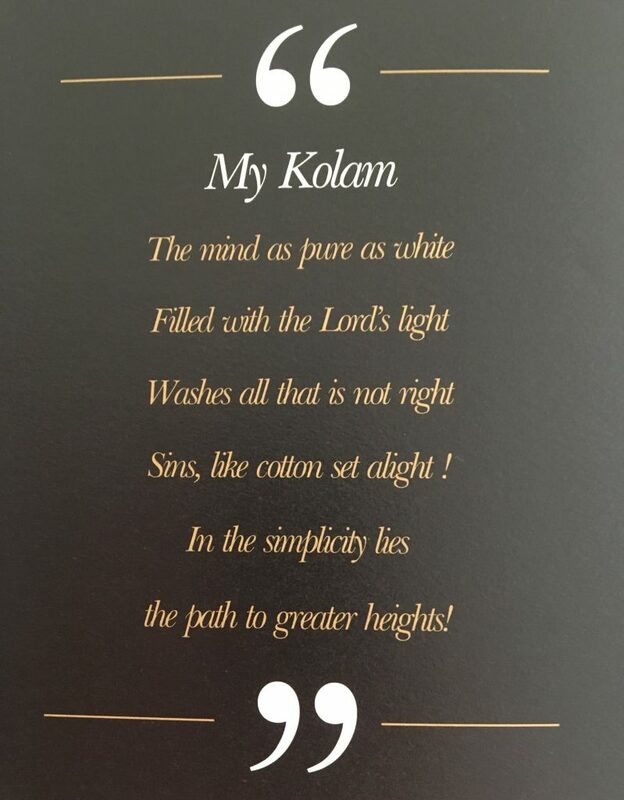 Each ‘Kolam’ made by Hema is accompanied by a small poem, penned by her. The book also gives an inside view into her journey, her learnings and her inspiration to start the Facebook page, The Lotus Shakti. Write to Hema to get your own copy of this wonderful book. If simply learning the beautiful art of ‘Kolam’ making is on your mind, do connect with her. “Making a ‘Kolam’ is a way of expressing yourself. There is no room for ‘judging’ “. “Spending time to make a ‘Kolam’ is immensely de-stressing, fulfilling, calming and a great way to build positivity. You can know only when you experience it”. ” ‘Kolams’ teach us to let go! every art form gives us something tangible, but you bid goodbye to a ‘kolam’ with a feeling in the heart”. Immensely inspired by Hema, and my creative brain rekindled, I decided to try my hand at a Kolam on the morning of 16th December, with the Thiruppavai verse playing in the background, with this innate need to experience the feeling! Well, the ‘Kolam’ wasn’t as lovely as my mind had visualised it to be, but hey! no judging! May the book inspire you too in more ways than one. Learn from different cultures, embrace the goodness in them, learn a new art form…Be Notjustashopper!